This Advent season, we are reminded of God’s promises of a coming Savior which He gave in the book of Micah chapter 5, verses 2 through 5. These words were prophesied over 700 years before Jesus was born in Bethlehem. The wise men were told to look for the baby king in Bethlehem because of these promises. But Bethlehem was an unusual place for a Savior to be born. Nobody really expected a Messiah to come from little old Bethlehem. But God loves to surprise us. He loves to make big things out of small things. Jesus was a surprise. He didn’t come to the strong, the beautiful, the rich, the powerful. He came to the small, the insignificant, the humble, the weak, the undeserving. Jesus continues to surprise us today! Over the next four weeks, while we get ready for Christmas, let us think about the surprising way that Jesus came to Earth in the little town of Bethlehem. 1. As a family, read Micah 5:2-5. What jumps out at you? Have every family member share something. 2. What is surprising about Bethlehem as a choice for the birthplace of the Messiah? How else did God surprise people when He sent Jesus? 3. Jesus is still surprising us. List some ways that Jesus is surprising to your family right now. Thank Him for those surprises in prayer. 4. Learn the song this month. As a family, sing O Little Town of Bethlehem. Book Reviews of "Biblical Theology in the Life of the Church"
Check out the newest book reviews at EFCA Today. This one is on Michael Lawrence's book, "Biblical Theology in the Life of the Church." I'm still in need of quite a few stories about gossip (not gossip, themselves!) for my applied research project and book. I am shooting for 200, and I probably have about 20 so far. [Matt's Messages] "The Proud, the Humble, and Jesus"
Luke begins the story by telling us the point. Luke begins his story about Jesus by telling us the point that Jesus is going to make. At least, in this passage, Luke tell us whom Jesus was addressing. Whom Jesus was hoping to hit with this teaching. Look at verse 9. Luke tells us right up front that this one is aimed at the proud. That’s whom Jesus is talking to. And His goal is to make them humble. One way or another. To make them humble. Don’t you just love how Jesus teaches? Even though He puts His finger right where it hurts the most, you have to love how He teaches. He tells stories, stories with a sharp, scalpel edge to them. A sharp, scalpel edge that cuts us right where the festering cancer lies. He cut us to heal us with His stories. So, in some ways, this is like last week’s story which was also about prayer, persistent consistent prayer. But the focus here is different. It’s not so much about prayer as it is about the hearts of the men who are praying. Now, there are two mistakes that we can easily make when we read this story. Two mistakes that I’ve made many times. One is to forget how Jesus’ original readers would understand the characters in it and their actions. To get the hats mixed up. This story is a lot like the story of the prodigal son. It’s told, especially, to those who are considered “white hats,” but the good guy doesn’t do what they expect him to do. And the black hat guy, the bad guy, really does what is UN-expected in this story. We can’t miss that, or we’ll miss the true impact of the parable. The second mistake we can easily make is to apply this story to someone else. To apply this story to someone else. It’s easy to put someone else’s face on the guys in this story and to really enjoy it. But miss that He’s talking to us. We each have to ask ourselves if He’s talking to me. Now, let’s get into this parable. How many characters are there? Now, let’s get this straight from the start. Which of these two would almost everyone who heard this story immediately think was the good guy with the white hat? This was the elder in the local church. This was the pastor of the flock. This was the guy who was on the straight and narrow. This was the guy you would trust with a business deal. You’d trust his wife to watch your kids. You knew that he was moral and upstanding. You’d vote for this guy. You’d trust him. Because he was a Pharisee, after all! Okay? That’s how nearly everyone would have felt when this character was introduced. Now, how about the other guy? Would you trust him? You’d trust him to cheat you. You’d trust him to steal from you. You’d trust him to sell you out to the Romans and get rich off your own people. A tax collector wasn’t just a guy doing his job. He was part of the legalized mob. It was legal for him to extort large sums of money for his own pockets as long as Rome got their fair share. And that’s why Jesus’ story is so shockingly powerful when you hear the rest of it! V.11. The first character begins to pray. All of a sudden, it becomes obvious that the Pharisee is not going to come out good in this story. He’s proud, and it shows. But God has very little to do with this prayer, does He? The NASB says “to himself.” He prayed to himself. I think that’s true. This guy was his own god. He is very religious, and he wants others to know it. He fasts twice a week. There was only 1 fast per year that was required. This guy fasts twice every seven days. And he gives a tenth of all he gets. He doesn’t just tithe his money, but probably tithes his spice rack. One tenth of everything! Beyond the call of duty! And he stands up in the temple, probably up front, and speaks about himself very loudly. Not very impressive, except to him. In fact, it’s sadly comical. I’m better. I am righteous. I am good. And I can and should look down on everybody below me. Before we go on, let’s not make the second mistake. The first mistake would be to miss the fact that everybody’s jaw has dropped right now because the supposed good guy has just been shown to be not so good after all. The white hat guy is the proud one? It’s bad to be proud of being good? The second mistake (again) is to apply this story to someone else. Someone you can think of that appears to be good, but when you scratch them, they bleed with pride. Don’t think about them right now. Think about yourself. Pastor Matt, think about yourself. Can we be like this proud Pharisee? Let’s ask the question this way. Are we proud of being good? Am I proud that I’m not a robber? Am I proud that I’m not an evildoer? Am I proud that I’m not an adulterer? Am I proud that I’m not a slimy tax collector? One commentary that I read this week said that the equivalent today in social standing of a tax collector is a drug dealer on the street corner of some inner city. Am I proud that I am not a drug dealer or a pimp? I might not get up in front of everybody and spout off a prayer like this! Fill in the blank for you. This man speaks up, too, and about himself, but it’s much harder to talk about your sins in public than your goodness. This man was truly humble. And he knew what he was at the core. A sinner. And he knew what he needed at the core. He needed mercy. He needed forgiveness. He needed propitiation. God’s wrath averted from his sin. He needed mercy and knew that He did not deserve it at all. They are drawn right out of what Jesus says here. They are not fancy. But they are good for us to hear. #1. THE PROUD WILL BE HUMBLED. That’s what Jesus says in verse 14. That’s one of Jesus’ favorite things to say. He said it already in chapter 14, verse 11. The Pharisee’s problem wasn’t so much that he was good. Is being good bad? Is it bad to be good? Of course not. Of course, it does matter why you are good. And it does matters whether or not your goodness truly comes from God. This guy was full of himself. That’s what Jesus says. He exalted himself. And everyone who does that will be humbled. ... Sooner or later. We need to repent of our pride. It’s good to be good, but it’s nothing to be proud of. And it’s nothing to put our trust in. This Pharisee knew that he had done good things (and they were good things), but it was a HUGE mistake to put his trust in them! Was this Pharisee, at heart, a good person whosae righteousness was enough to impress God and meet His standards? Jesus says elsewhere that unless our righteousness surpasses the Pharisees, we won’t enter in to the Kingdom of Heaven! And He didn’t go home justified. He didn’t go home being declared righteous enough and right with God. That should give every religious person a reason to stop and analyze their heart. What are you trusting in for your justification? The Proud Will Be Humbled. And it won’t be pretty. But #2. THE HUMBLE WILL BE EXALTED. Humility is incredibly attractive to God. It doesn’t make us worthy to God. We should stand at a distance. We should not look up to heaven. But that’s the just the kind of heart that God loves. He loves a humble heart. He loves it when we call it like it is and cry out to Him for help. It was that second man who went home JUSTIFIED before God. And we know how that is possible. This man’s righteousness wasn’t enough either, but He cried out in humble faith to the One who could give him mercy and grace and found it at the mercy seat. In the terms of the rest of the New Testament, He was justified by grace alone. Nothing in my hand I bring. Simply to thy Cross I cling! And...will enter the kingdom of God. #3. THE TRUSTING WILL ENTER THE KINGDOM. In verses 15-17, Luke includes another story to bring home this point about humility. Can you imagine? They just didn’t get it. They are trying to protect the Master. Put positively, only those who receive the kingdom of God like a little child will ever enter it. Children are small, often neglected, marginalized, necessarily humble. And, therefore, they are trusting. With humble trust. They have to be. They cannot survive on their own. They know that they are needy, and they look to big people to help them. If you aren’t like that, then you aren’t going to see the kingdom of God. It’s not good people who enter the Kingdom. It’s not people with conservative, family values. It’s not good people who enter the Kingdom of God. It’s the humble who trust in Jesus. What’s the application of this passage? And that’s for those who are already in the kingdom and those who have not yet entered in. If you have not yet entered into the kingdom, the call on your life today is to humble yourself and become like a little child and trust in Jesus. Jesus came to save sinners. Those who will admit that they are sinners and need mercy, will find it in Jesus. Don’t count in your own goodness. Don’t be confident in your own righteousness. I don’t care if you’ve been going to church all of your life and you’re like Billy Graham or something in your reputation for godliness. If you are trusting in that, you are doomed. You will be humbled forever. Humble yourself and trust in Jesus and enter the kingdom. And you will be exalted. Humble yourself is not just stooping at the entrance to the kingdom to fit in the door and then proudly going about your business inside the kingdom like a pharisaical peacock! Humility is the continuing posture of the kingdom. Don’t get to looking down on everybody else–especially those who are worse sinners than you. [Matt's Messages] "Jesus Says, 'Keep Praying'"
In today’s passage, Jesus tells a story. And it’s a story about prayer. Persistent prayer. It has sometimes been called the Parable of the Unjust Judge. And other times, it’s been called the Parable of the Persistent Widow. It’s probably a familiar story to most of us. One of the things I love about this story is that Luke tells us up front what the point of the parable is. He doesn’t always do that! Sometimes, he just gives us Jesus’ parables with no explanation at all! And more often, the point is given at the end. Here, the point is restated in some interesting ways at the end–that help us to understand it better. But Luke tell us at the beginning what the whole point of the parable is. There is the point of the whole parable. Always pray and don’t give up. Do you sometimes feel like giving up on prayer? I know that I do. At least, when I’m being honest. There are times when I’ve prayed and prayed and prayed, and it just didn’t seem like my prayers were going anywhere. Like they went up to the ceiling and then bounced back down. Man! Sometimes you just feel like giving up on prayer. Maybe you’ve never felt that yet, but there will probably come a time when you do, so listen up. Jesus says to keep praying. But that doesn’t mean to not pass out while praying. To keep praying and not wear out. To continue to be men and women and boys and girls of persistent prayer. Especially to keep praying for justice. We’re going to see here that the main thing that Jesus is talking about is praying for justice to be done. Not praying primarily for health or wealth or even blessing. Which are not necessarily bad things to pray about. But to pray for justice to come. But He doesn’t just say it, He shows it. V.1 again. It’s a story with only 2 characters in it. A judge and a widow. The powerful and the powerless. Uh oh! That sounds like a bad start to a good story. That’s not the kind of judge you want to have! Can you imagine a judge like that? I always had a hard time imagining a judge like that until recently. When I was growing up, I had a strong sense of authority. There might be crooked judges on television, but there probably weren’t very many of those in real life. And I still believe that, really. I believe that the vast majority of judges in America are trying to do a good job. But I’ve recently had occasion to visit a courtroom, and I saw a judge in action that kind of shook my faith some in the judicial system. It’s not as hard for me now to imagine an evil person in position of authority. And this one is really evil person. Jesus paints him in the darkest colors. He doesn’t care about right and wrong. He doesn’t care about God’s standards. And he doesn’t care about people. He doesn’t care about justice. The unjust judge. Very powerful and very dangerous. However, he has just met his match. Now if the judge is the epitome of powerfulness, the widow is the epitome of powerlessness. Widows had very little social standing in Jesus’ day. With no husband, it was very hard for them to get justice. If they had no extended family to care for them, it was very difficult for them to thrive and even to survive. That’s why James says that pure religion indeed is to take care of widows in distress. This widow was in distress. Someone had done her wrong. In fact, it seems as though that other person was continuing to do her wrong. Her “adversary.” We aren’t told what that person was doing except that it was against her and unjust. Perhaps he or she was stealing from her. We don’t know. But it was clearly against this powerless woman and unjust. Have I worn you out yet? I love that speech that the unjust judge gives to himself. The Greek there is literally means, “so that she doesn’t give me a black eye.” And I don’t think he cared about the shame of a black eye. He doesn’t care about what men think. He’s concerned that this little widow will give him a TKO, a total knock out. “She’s going to wear me out. I’m going down for the count. Now, what’s the point of this story? If I’m listening to what the unjust judge says like Jesus says to, what will I do? Luke already told us, didn’t he? V.1? Which of the two characters are we supposed to be like? Keep coming with your requests for justice. Keep knocking. Keeping asking. Keep seeking. #1. BECAUSE GOD IS NOT LIKE THE UNJUST JUDGE. Who is the judge supposed to be like in this story? We are supposed to be like the widow. So who does the judge picture? But the argument is from the lesser to the greater. Look at verse 7. Do you see where Jesus is going? If the unjust judge will bring justice, HOW MUCH MORE will God do it?!!! God isn’t anything like the unjust judge! He isn’t unjust! He’s just. He does do what is right! All of the time! He does care about men. We are not unrelated to Him. This widow had no relationship with the judge. We are God’s adopted children through Jesus! He isn’t just an unjust judge. He is our loving heavenly Father! So, you get the argument? Do you feel the comfort? You can’t bother Him by praying too much! If you can wear down an unjust judge, why wouldn’t you repeatedly pray to a just and merciful Father? God is not like the unjust judge. We have to get this into our heads. Because we can get this wrong. We can begin to think that we have to keep on praying because God is hard of hearing or because it’s only repeated prayers that get his attention. In his book, Reaching God’s Ear, Pastor Sam Storms asks some questions to evaluate our prayer life. “Do we repeat a request because we think that the quality of a prayer is dependent on the quantity of the words? Do we repeat a request because we think that God is ignorant and needs to be informed, or if not ignorant at least he is unconcerned and therefore needs to be aroused? Do we repeat our prayers because we believe that God is unwilling to answer and we must prevail upon him, somehow transforming a hard-hearted God into a compassionate and loving one? That’s acting as if God WAS like the unjust judge! We should keep on coming to God in prayer because of our relationship with Him. Now, it’s not going to always feel like that. Sometimes, it’s going to feel like He is putting us off. When it does come, it will seem quickly. And in the grand scheme of things, it couldn’t come faster. Here’s reason number 2. It’s going to sound strange, but keep with me. #2. BECAUSE GOD IS LIKE THE UNJUST JUDGE. He will, in His timing, bring justice. God is powerful. God is authoritative. And God will bring justice, vindication, vengeance if necessary. He will bring justice. V.8 again. So keep praying and don’t give up. Now, let’s talk some more about this justice thing. I never really got how much this parable was about justice until I studied it this week. I knew it was about prayer, persistent, consistent prayer. But this week I really noticed that this prayer is primarily crying “out to him day and night” for justice. It is things being right in the world. Justice is things being the way they should be in the world. And right now, things are not as they should be. I don’t know if you’ve noticed that, but things in this world are not as they should be. Last week, we saw that the kingdom of God has come in the person of Jesus. But that the kingdom has not yet come as it will be. The kingdom is already but not yet. Already here but not yet here in perfect justice. We have to live in the time when things are not yet as they should be but we know that it will come. Do you pray like that? Have you given up praying like that? Don’t stop. Don’t faint. Don’t lose heart. Keep praying. Because in this one way alone God is like the unjust judge–He will answer the continued request and bring justice and quickly! However (v.8), Jesus turns around and asks a searching question. Remember last week, the third point? The first point was that the Kingdom of God Has come in Jesus (the Son of Man). The second point was that the Kingdom of God Has NOT YET COME as it will be. The third point was that the Kingdom of God WILL COME when Jesus returns. And until that point, He want us to trust Him. #3. GOD WANTS US TO KEEP TRUSTING HIM UNTIL HIS KINGDOM COMES. Keep praying and don’t give up because when you are doing that you are trusting Jesus–faith–and that’s what He wants to find when He returns. Do you see whose prayers are answered? This justice comes to those who are trusting in Jesus. If you are not yet a believer, a truster, in Jesus, then these promises don’t apply to you yet. You can’t know that you will get justice eventually. Actually, you will, you will get perfect justice. That’s what Hell is. Hell is perfect justice meted out on people who deserve it. But you won’t get this kind of saving justice. That’s only for those who trust in Jesus. Because Jesus died for justice. He took on the just wrath of God for the sins of His chosen people so that justice would be done and be seen to be done. And so that God could justify the ungodly. Declare the unjust justified! That comes by trusting in Him. And keeping on trusting Him until Jesus returns. Are you tempted to give up on prayer? Because God is not like the unjust judge. He doesn’t need wearing down. He loves you! So keep coming to Him like the eager Daddy He is to hear your prayers. Don’t give up on prayer. Because God is like this judge in just one way – He will bring justice and quickly. So keep coming to Him with your requests that He mend the world, that He make things right again in small ways now and big ways, too and then totally some day all around the world and forever! Because God wants you to keep trusting Him until His Kingdom Comes. Just finished reading a brief and insightful article by Heath Lambert on how complementarian marriages should work when spouses disagree. This is just the kind of careful thought that needs to be brought into these kinds of questions. As part of my research for my gossip project, I'm reading books on the topic of shame and reputation. Some of the illustrations have been...vivid, painful, sharp, striking, and helpful. When I get to writing the book on gossip, I want the illustrations to have a realness to them, an authenticity. I don't want to shock or titillate, but I do want to show how this is part of the nitty-gritty of real life. Many books in the genre that I'm working in can have a very artificial feel, namby pamby, unreal. I want nitty gritty, not namby pamby. Which, by the way, is another reason for readers like you to turn in a gossip story. I finally cleaned up some of the stuff "behind the scenes" here at Hot Orthodoxy. One things was the Facebook connection via Networked Blogs. For some reason (probably my typo), the blog was listed as matt-midchell (you'd think I could spell my own name...), so it wasn't connecting well with Facebook. If you have "followed" this blog via that old route, you may want to choose to follow the blog again. I think it's all "fixed." Let me know if you have any problems. And thanks for reading! Coming soon...more about the problem of gossip than you ever wanted to think about! [Matt's Messages] "Jesus and the Coming Kingdom"
If there was a short list of our Lord Jesus’ favorite topics of conversation, the Kingdom of God would be near the top. Our Lord Jesus loved to talk about the Kingdom of God. He loved to teach about the Kingdom of God. Luke has already used the words “The Kingdom of God” twenty times so far in the first 17 chapters of his gospel, and Jesus spoke most of them. Well, the Pharisees have heard Jesus talk about the Kingdom of God and talk and talk and talk, so they begin to press Jesus for more details about this kingdom. And in today’s passage, they want to know when it would come. Well, that’s a question of eschatology. That’s a question about the end-times. The end of the world. The fulfilment of prophecy. And, even though it comes from the Pharisees, it’s a pretty good question. At least, it’s one that we all want to know about. Well, I don’t know about you, but I find eschatology to be one of the trickiest parts of biblical doctrine to figure out. For one thing, it hasn’t happened yet. So, you can’t go back like history and just piece it together. It’s still future, so that makes it kind of tricky. And there are a lot of eschatological (end-times) details to harmonize. The Bible talks a LOT about future events and however you put them together, they all have to fit together. So that makes it a complex job. And there can be several different ways of putting together the prophetic information that makes some sense of it. So very good, very godly scholars and pastors can sometimes come to very different conclusions on some of the more debatable points. And that makes it kind of tricky, as well. I’ve had 12 years of formal theological education, and I’ve been a pastor for about 15 years, but I don’t have all of my questions answered yet about eschatology. However, there are some things that I think are crystal clear. And three of them are right here in our passage for today. Jesus teaches on the coming of the kingdom of God. #1. THE KINGDOM HAS COME. There is no need to hunt for the kingdom of God because the kingdom of God is among you. The kingdom is here. Now, that’s one way to translate the Greek words, but I don’t think that’s what Jesus meant. Why? The aggressive, unbelieving, hostile Pharisees. Do you think that Jesus would tell them that the Kingdom of God is inside of them? How is the kingdom of present? What is in their midst? WHO is in their midst? Who is among them? The king has come, so the kingdom has come! And the Pharisees are, as usual, missing it! Don’t ask, “when is the kingdom of God going to come?” Don’t go running around saying, “Here it is. Oh, I think there it is!” No. See the kingdom in the king. The presence of the king means the kingdom is present! The Pharisees were willfully blind to this. Everything pointed to it. But they would see it. And most today are missing it, too. Jesus is the King, and He has come, so the Kingdom has come, at least in part. Now, the second thing we’re going to see here is going to seem contradictory. #2. THE KINGDOM HAS NOT COME. Not the way it will. There is a sense in which the kingdom has arrived with the first arrival of the king, but there is a sense which the kingdom has not yet arrived. Not in its consummation. The Kingdom of God is ALREADY and NOT YET. The kingdom has not come. Listen to verse 22-25. The Kingdom of God has not (yet) come. For one thing, Jesus still has to go to the Cross. There is no Crown without the Cross. First the Cross, then the Crown. The King will die to purchase His Kingdom! But even after that, the Kingdom will not come right away. Look at v.22 again. You’re going to long, to yearn, to ache for the Kingdom of God. And it won’t be here yet. One of the things that Jesus taught about the Kingdom of God is that there would be some kind of a delay before it came in its fullness. Now, we don’t know how long that delay will be. It’s been about 2,000 year so far. And that makes some people laugh at the idea of living an expectant and ready life waiting for His return. But that’s what Jesus said was going to happen. It’s not like it was a surprise! Jesus taught that there would be some considerable delay. He didn’t say how long, and He said to stay ready (we’re going to see that in just a second), but He also said to stay patient. Long for the return of Christ and long for the Kingdom of God but keep waiting. Now, that’s hard to do. But Jesus didn’t say it was going to be easy. Right now, we long for the days of the Son of Man. Don’t you long for the days of the Son of Man? Don’t you long for the fulfillment of all of God’s promises? The longer I live, the more I want the Kingdom to Come. But it’s not here yet. And I need to be patient. Don’t worry. If you long for the coming of the kingdom of God, then don’t worry about missing it. You won’t miss it. It will be obvious. It will be like the lightning, which no one can miss. Don’t go running after those who have their little secret Jesus to sell you. His second coming will not be hidden. Be patient. Don’t worry about missing it, if you long for the coming of the kingdom of God. However, if you do not long for the coming of the kingdom of God, then you should worry about missing it! #3. THE KINGDOM WILL COME. The kingdom of God is coming. And it is coming in judgment. Jesus likens it to the days of Noah and the days of Lot. And there are two points of comparison. One is that both of those days were proverbially ungodly. They were ungodly days ripe for judgment. Those are very ungodly people doing very ordinary things. They were pre-occupied with their little lives and unconcerned about God and indifferent to His kingdom, and they were swept away in judgment. I think that this is one of the clearest things that Jesus taught about the end-times–the need to be ready for His return. I don’t understand all of the details, but this comes through loud and clear. Are you ready for Jesus’ return? Part of being ready means resisting the pull of possessions. She loved Sodom, the city doomed to destruction, and she turned around and was reduced to a pillar of salt. My kids were recently at a life-sized museum of Bible people and they said that Mrs. Lot was there and she was turning around and it was really gross. Ewww. And Jesus wants us to remember it. Don’t love this life. Prepare for the next one. Because the judgment is coming. It will hit unexpectedly and it will bring a final division of the human race. The judgment that is coming will be gruesome...and just...and sudden...and permanent. And we have to choose now. There won’t be time then for choosing. The time for choosing sides is now. You can’t sit on the fence. There is no fence. There are those who belong to Jesus and those who do not. The Kingdom will come. Are you ready for it? Most of the Pharisees were not. They couldn’t even see that the Kingdom had been inaugurated with the coming of the King. They didn’t long for the kingdom to come. They were rejecting Jesus and were going to send Him to the Cross. Do you long for the Kingdom of God? 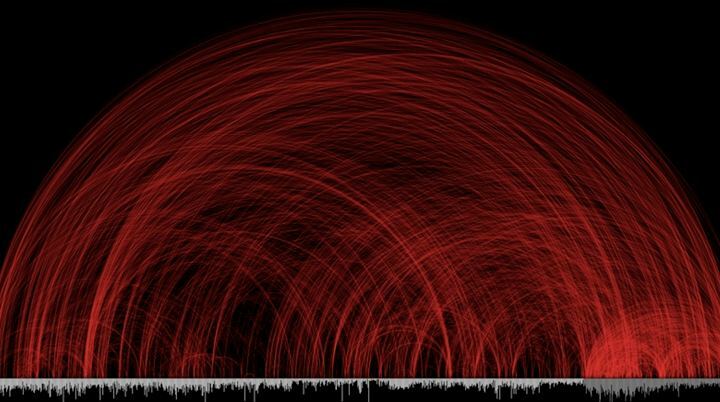 Great article by Matt Perman responding to the Fast Company article and nifty graphic about (apparent) contradictions in the Bible. A great overview of the supposed problem. Also fun to read (though more snarky and therefore less helpful, in my opinion) are these responses from Justin Holcumb and Douglas Wilson. It's important to not worry about this but also to speak a clear and confident word back to those who don't yet get just how trustworthy the Bible really is. My first week referencing the Newest International Version, and I've already found a real improvement! This week's message is on Luke 17:20-37. Verse 21 is very unfortunately translated in the original NIV. "Once, having been asked by the Pharisees when the kingdom of God would come, Jesus replied, "The kingdom of God does not come with your careful observation, nor will people say, 'Here it is,' or 'There it is,' because the kingdom of God is within you" (vv.20-21, emphasis added). Yes, "within you" is a possible translation of the Greek. Very likely translation in thousands of other places. But, I seriously doubt that Jesus was telling the unbelieving, hostile Pharisees that the kingdom of God was inside of them! More likely was the NIV footnote, "or 'among' you." That's what I'll be pointing out tomorrow morning and making the point that the Kingdom of God was present right there and right then because JESUS was present right there and right then. The presence of the King means the Kingdom is present! So, when I checked the NNIV in my study today, it said: "Once, on being asked by the Pharisees when the kingdom of God would come, Jesus replied, “The coming of the kingdom of God is not something that can be observed, nor will people say, ‘Here it is,’ or ‘There it is,’ because the kingdom of God is in your midst” (vv.20-21, emphasis added, with a footnote for the original reading). The NIV, the main version of the Bible that I preach from each Sunday, has continued to be updated throughout its history (some updates have been better than others). Recently, the newest version (Newest International Version?) has been digitally published (along with translator's notes). Below is a video introduction to this NNIV by my former professor, Doug Moo. I'm looking forward to having this as another tool in my toolbox for interpretation of God's Word. Winsome, hearty, clear, humorous, and thoroughly biblical, Marriage Matters: Extraordinary Change Through Ordinary Moments is a realistic look at marriage and what it takes to truly improve our relationships. 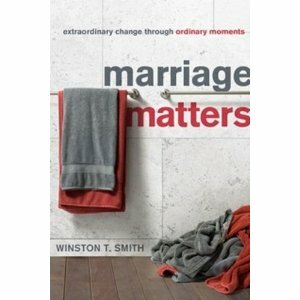 Winston Smith starts with a theological foundation--our marriages aren't just about us, they are about God and His extraordinary love. Then he takes that gospel foundation and builds a strong household upon it. The second and third sections are not just theoretical but intensely practical, and he demonstrates all of the principles he is teaching through real-to-life illustrations from the perspectives of both the wife and the husband. This is Smith's first full-length book, and, at times, it feels kind of like a textbook. After all, he is a seminary professor! But unlike most books on marriage, this is the book that I would want my "class" to read. A bonus for me is that I've had Smith as a teacher and taken the class from which this book arose. This is really good stuff. Consider this exhortation from pages 36-37: "If your marriage is going to change, you need to change. It's easy to waste time waiting, hoping, perhaps insisting that your spouse change. Sadly, you have no power to make another person change. When you begin your quest for change by looking at yourself and your own need for change, then you can have hope. You have a responsibility and also the ability to change. But you can only do that in a lasting, meaningful way as you turn from your own idols and learn to live a life of true worship." Challenging and hope-giving in the same paragraph! As a pastor, I've searched high and low for a "go-to book" on marriage--one that I could agree with nearly 100% of its counsel and one that was good to read by both the husband and the wife. Now I've found it. Highly recommended. This is one of my favorite stories about Jesus. I was kind of hoping that this story would fall on the Sunday right before Thanksgiving, but this is the day that God has given for us to study it, and I also think it goes really well with Communion. So, I’m glad that it’s today. We live in an age of ungratefulness. Now, I don’t know that there ever was an age of thanksgiving, but I do know that people in our society are increasingly ungrateful. We just expect to be given good things and the words “Thank you” are not nearly enough on our lips. And Christians, followers of Jesus Christ, should be the most thankful people on planet Earth. This is a story about one man who was very thankful to Jesus. He was an unlikely candidate. He was a leper, an outsider to all human society because of his skin disease and unclean status. And more than that, he was not a Jew. He was not one of Jesus’ race. He was a despised Samaritan. But he was thankful. And he had every reason, as we will see, to be thanking Jesus. I want us to look closely at the two main characters: Jesus and the Thankful Leper. Before we get to the thankful leper, I want to us think about Jesus here in this story. What is revealed to us about Jesus? What do we learn here in this story about Jesus? Well, first of all, Jesus was on his way to Jerusalem. You see that in verse 11? This is the third time that Luke has mentioned that Jesus is on his way to Jerusalem. And it’s not really that geographically Jesus is nearer to Jerusalem. He’s been nearer in previous chapters. But Luke is making a different point. He’s saying that Jesus is set on going to Jerusalem. Jesus knows where He is headed. He is headed to the Cross. He is headed to passion week. He is headed to suffering. Being betrayed, being arrested, being tried, being mocked, being scourged, being killed. Jesus is on His way to Jerusalem. And He knows it. And it must be weighing on Him. But still He goes. And...still He stops to show mercy and compassion to these lepers. And Jesus does. We can’t miss the compassion of Jesus here. Even though He is on his way to Jerusalem, Jesus is full of compassion. He is moved by their plight and by their appeal. And He does something. He sends them on a cleansing mission. Notice that Jesus doesn’t just heal them. He requires faith and obedience. He requires them to trust Him and obey Him. Sound familiar? He is going to cleanse them. He is going to heal them. But He is actually calling to more than that. He is calling them to discipleship. Well, back in Leviticus 14, the law said that if someone was healed of an infectious skin disease (and that would be pretty rare! ), they were supposed go show themselves to the priests, who would certify that they were now clean. And after an 8 day ritual that included sacrifices, the cleansed leper would be able to be restored to society–especially to his family! Trust and obey. There is no other way to be happy with Jesus than to trust and obey. And they do. We don’t know what was running through their minds, but they take Jesus up on His command, and they go. V.14 again. The skin disease was reversed! Unhealthy skin became healthy again. Uncleanness was washed away and became clean. Perhaps festering body parts that were wasting away were regenerated and grew back on their faces, on their extremeties. We don’t know exactly what happened, but we know that it was amazing! And Jesus did it. What do we learn about Jesus here? He is not only determinately on His way to Jerusalem and full of compassion for the suffering, and requiring faith and obedience. He is full of power! Wonder-working power! Miracle-working power. We’re going to talk about this guy in a just a second. But for now, I want us to keep looking at Jesus. What do you see here about Jesus? Do you see Jesus accepting thanksgiving and even worship? This man throws himself at Jesus’ feet and thanks Him. Can you imagine what that would have been like? Have you ever thrown yourself at someone’s feet? It looks a lot like worship! Now, it may be that this man was just treating Jesus as a great king and not yet as his God. He might not know yet Who Jesus really is. No, He accepts this man’s reverence and thanksgiving. Here’s something to see about Jesus. One out of ten? 10 percent? That’s the only return? Jesus isn’t whining. But He’s not impressed either. Only 10% of the cleansed lepers were thankful. And Jesus cares. He wants the cleansed lepers to be thankful–to give praise to God! We can be certain Jesus cares about that. Now, let’s turn to the other main character–the one we’ll call the Thankful Leper. We don’t know his name. We’re never told. And of course, he’s not a leper any more. But the “Thankful Former Leper” sounds dumb. So, let’s think about him for a few seconds. Of course, in this story, he’s the one more like us, right? Or at least, the one we should be like. Sometimes, we’re like the other 90%, aren’t we? This man has every reason to be thankful, doesn’t he? He was a Samaritan (and remember, the Jews and the Samaritans basically hated each other). He was despised. He was rejected. He was unclean. He was “outside.” He was outcast. He was alone. Probably the other 9 lepers were Jews. That’s why Jesus is surprised in verse 18 that only the foreigner came back. He’s not complaining about the foreigner. He’s complaining, He’s disappointed in His kinsmen according to the flesh. But this Samaritan leper has been brought near. He has been cleansed. He has been accepted. He has been made whole. And that is the chief reason for us to be thankful people, ourselves. We have been loved by Jesus. We who were rebel sinners are now seated at His table. Do you feel the love of Jesus today? I want you to know how much the Lord loves you. The social equivalent of this is probably someone with HIV. Or someone who is of a different and despised race. Do you feel like someone on the outside looking in? He has compassion for you. He set His face towards Jerusalem for you! And He didn’t stop until He achieved His goal. He is full of power. And if you belong to Jesus, then you are no longer unclean but clean. No longer unforgiven but forgiven. No longer unacceptable but accepted. No longer far away but near. No longer an outsider but an insider–a family member, a son or daughter of God! And therefore you should be thankful. Number two: The former leper was thankful. Verses 15 and 16 are the best this story. Let’s read those again. I love that “loud voice” in verse 15. The Greek words are basically “mega” and “phone” where we get our megaphone from. And he’s so physical. He throws himself at Jesus’ feet and thanks Him. He understood what had happened to him, and he was truly thankful. This is why we sing at church and not just speak in a regular voice. Because some things need song. And some things need shouting. If you shout at a football game, then you should shout in thankful worship. We can’t help but praise. We can’t help but be moved by some feat at sports. We should be so moved when being thankful. That’s what it means to be a part of the 10% who are truly thankful. Do our lives show it? We have been loved with a great love, so great should be our thankfulness. Christians should be the most thankful people in the world. And here’s the biggest reason why. The leper was saved, not by works, but by faith. Look at the tag line at the very end of the story. V.19. Don’t miss this. It can also mean healed. And that’s the basic idea here. But, I think there is something more. Because this man “got it” and had faith in Jesus and praise God and wanted to be thankful, Jesus is saying that he is healed in a bigger sense than just physically. Not by works. But by faith in Jesus. And the same is true for you and me. If we have faith in Jesus then we are saved. And there is no greater reason to be thanking Jesus.